A cross-section of traditional rulers in Abia have advised political office seekers in the country to put the interest of Nigeria above their personal ambition. 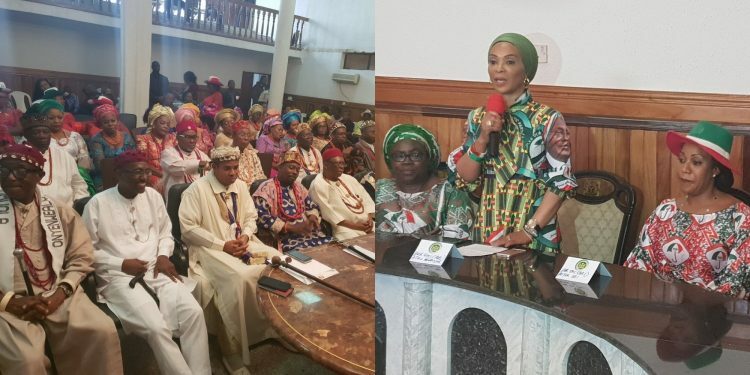 The monarchs gave the advice during their interaction with the womenâ€™s wing of Atiku-Obi Campaign Organisation on Wednesday in Umuahia. The group was led on the visit by Mrs Jennifer Abubakar, the Wife of the Presidential Candidate of the Peoples Democratic Party (PDP) in the upcoming general elections. Speaking separately at the meeting, the monarchs called for the emergence of visionary and patriotic leaders that would work for the unity and progress of Nigeria. Eze Samuel Okorie from Ohafia said that it was pertinent for Nigerians to put the future of the country into consideration as they geared up for the general elections. Okorie further urged the electorate to use their Permanent Voter Cards wisely to choose quality and visionary representatives at all levels. He warned politicians to shun acts of violence, politics of bitterness and desperation to win at all cost. The monarch underscored the need for the contestants and their supporters to support the Independent National Electoral Commission in its pledge to conduct peaceful, free, fair and credible elections. He said that as former vice president, Atiku demonstrated the capacity and capability to lead the nation. Also, Eze Friday Ikpeazu, the Chairman of Obingwa Traditional Rulers Council, said that the visit of the organisation was an indication that Atiku had the interest of Abia people at heart. Ikpeazu said that the people of the state were desirous to support candidates that would ensure even distribution of the nationâ€™s resources and dividend of democracy. Eze Kalu Ogbu of Abiriba said that the people of Abia would not hesitate to support any cause that would promote the unity and socio-economic development of Nigeria. Ogbu said that Nigeria was at a cross-road and needed a pragmatic leader that would successfully tackle insecurity and other numerous challenges that bedevilled the nation. Earlier, the wife of the PDP presidential flag bearer said that she was in Abia to seek the support of the people for her husbandâ€™s presidential bid. Abubakar appealed to the traditional rulers to mobilise their subjects to support and vote massively for her husband at the polls. She said Atiku had progressive visions and goals which, according to her, will make Nigeria to achieve substantial growth in all sectors of the economy, if voted into office.